This article is about the region in the Baltic. For the Italian municipality, see Ingria, Piedmont. Ingria and its Lutheran parishes in the Russian Saint Petersburg Governorate, circa 1900. Historical Ingria (Finnish: Inkeri or Inkerinmaa; Russian: Ингрия, Ingriya, Ижора, Izhora, or Ингерманландия, Ingermanlandiya; Swedish: Ingermanland; Estonian: Ingeri or Ingerimaa) is the geographical area located along the southern shore of the Gulf of Finland, bordered by Lake Ladoga on the Karelian Isthmus in the north and by the River Narva on the border with Estonia in the west. The Orthodox Izhorians, along with the Votes, are the indigenous people of historical Ingria. With the consolidation of the Kievan Rus and the expansion of the Republic of Novgorod north, the indigenous Ingrians became Greek Orthodox. Ingria became a province of Sweden in the Treaty of Stolbovo in 1617 that ended the Ingrian War, fought between Sweden and Russia. After the Swedish conquest of the area in 1617 the Ingrian Finns, descendants of 17th-century Lutheran emigrants from present-day Finland, became the majority in Ingria. In 1710, following a Russian conquest, Ingria was designated as the Province of St. Petersburg. In the Treaty of Nystad (1721), Sweden formally ceded Ingria to Russia. In 1927 the Soviet authorities designated the area as Leningrad Province. Deportations of the Ingrian Finns started in late 1920s, and Russification was nearly complete by the 1940s. As of 2015[update], Ingria forms the northwestern anchor of Russia—its "window" on the Baltic Sea—with Saint Petersburg as its centre. Ingria as a whole never formed a separate state (compare however North Ingria); the Ingrians, understood as the inhabitants of Ingria regardless of ethnicity, can hardly be said to have been a nation, although the Soviet Union recognized their "nationality"; as an ethnic group, the Ingrians proper, Izhorians, are close to extinction together with their language. This notwithstanding, many people still recognize their Ingrian heritage. Historic Ingria covers approximately the same area as the Gatchinsky, Kingiseppsky, Kirovsky, Lomonosovsky, Tosnensky, Volosovsky and Vsevolozhsky districts of modern Leningrad Oblast as well as the city of Saint Petersburg. In the Viking era (late Iron Age), from the 750s onwards, Ladoga served as a bridgehead on the Varangian trade route to Eastern Europe. A Varangian aristocracy developed that would ultimately rule over Novgorod and Kievan Rus'. In the 860s, the warring Finnic and Slavic tribes rebelled under Vadim the Bold, but later asked the Varangians under Rurik to return and to put an end to the recurring conflicts between them. 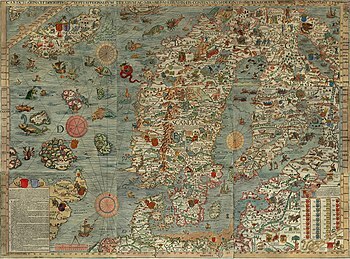 The Swedes referred to the ancient Novgorodian land of Vod as "Ingermanland", Latinized to "Ingria". Folk etymology traces its name to Ingegerd Olofsdotter, the daughter of the Swedish king Olof Skötkonung (995–1022). Upon her marriage to Yaroslav I the Wise, Grand Prince of Novgorod and Kiev, in 1019, she received the lands around Ladoga as a marriage gift. They were administered by Swedish jarls, such as Ragnvald Ulfsson, under the sovereignty of the Novgorod Republic. In the 12th century, Western Ingria was absorbed by the Republic. There followed centuries of frequent wars, chiefly between Novgorod and Sweden, and occasionally involving Denmark and Teutonic Knights as well. The Teutonic Knights established a stronghold in the town of Narva, followed by the Russian castle Ivangorod on the opposite side of the Narva River in 1492. Ingria remained sparsely populated. In 1664 the total population amounted to 15,000. Swedish attempts to introduce Lutheranism, which accelerated after an initial period of relative religious tolerance, met with repugnance on the part of the majority of the Orthodox peasantry, who were obliged to attend Lutheran services; converts were promised grants and tax reductions, but Lutheran gains were mostly due to voluntary resettlements by Finns from Savonia and Finnish Karelia (mostly from Äyräpää). The proportion of Lutheran Finns in Ingria (Ingrian Finns) comprised 41.1% in 1656, 53.2% in 1661, 55.2% in 1666, 56.9% in 1671 and 73.8% in 1695, the remainder being Russians, Izhorians and Votes. Ingermanland was to a considerable extent enfiefed to noble military and state officials, who brought their own Lutheran servants and workmen. However, a small number of Russian Orthodox churches remained in use until the very end of the Swedish dominion, and the forceful conversion of ethnic Russian Orthodox forbidden[when?] by law. Nyen became the main trading centre of Ingria, especially after Ivangorod dwindled, and in 1642 it was made the administrative centre of the province. In 1656 a Russian attack badly damaged the town, and the administrative centre moved to Narva. In the early 18th century the area was reconquered by Russia in the Great Northern War after having been in Swedish possession for about 100 years. Near the location of the Swedish town Nyen, close to the Neva river's estuary at the Gulf of Finland, the new Russian capital Saint Petersburg was founded in 1703. Peter the Great raised Ingria to the status of a duchy with Prince Menshikov as its first (and last) duke. In 1708, Ingria was designated a governorate (Ingermanland Governorate in 1708–1710, Saint Petersburg Governorate in 1710–1914, Petrograd Governorate in 1914–1924, Leningrad Governorate in 1924–1927). In 1870, printing started of the first Finnish-language newspaper in Ingria, Pietarin Sanomat. Before that Ingria received newspapers mostly from Viborg. The first public library was opened in 1850 in Tyrö. The largest of the libraries, situated in Skuoritsa, had more than 2,000 volumes in the second half of the 19th century. In 1899 the first song festival in Ingria was held in Puutosti (Skuoritsa). By 1897 (year of the Russian Empire Census) the number of Ingrian Finns had grown to 130,413, and by 1917 it had exceeded 140,000 (45,000 in Northern Ingria, 52,000 in Central (Eastern) Ingria and 30,000 in Western Ingria, the rest in Petrograd). From 1868 Estonians began to migrate to Ingria as well. In 1897 the number of Estonians inhabiting the Saint Petersburg Governorate reached 64,116 (12,238 of them in Saint Petersburg itself); by 1926 it had increased to 66,333 (15,847 of them in Leningrad). As to Izhorians, in 1834 there were 17,800 of them, in 1897—21,000, in 1926—26,137. About 1000 Ingrians lived in the area ceded to Estonia under the Peace Treaty of Tartu (1920). Under the Russian-Estonian Peace Treaty of Tartu of 1920, a small part of West Ingria became part of the Republic of Estonia. In contrast to other parts of Ingria, Finnish culture blossomed in this area. This was to a large extent due to the work of Leander Reijo (also Reijonen or Reiju) from Kullankylä on the new border between Estonia and the Soviet Union, who was called "The King of Ingria" by the Finnish press. Finnish schools and a Finnish newspaper were started. A church was built in Kallivieri in 1920 and by 1928 the parish had 1,300 people. In 1945, after the Second World War, Estonian Ingria, then in the Soviet Union, became part of the Russian SFSR. Since Estonia reclaimed its independence in 1991, this territory has been disputed. As Russia does not recognize the Peace Treaty of Tartu, the area currently remains under Russian control. 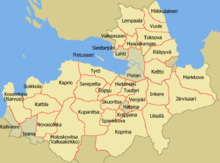 After the 1917 Bolshevik revolution in Russia, the Republic of North Ingria (Pohjois Inkeri) declared its independence from Russia with the support of Finland and with the aim of incorporation into Finland. It ruled parts of Ingria from 1919 until 1920. With the Russian-Finnish Peace Treaty of Tartu it was re-integrated into Russia, but enjoyed a certain degree of autonomy. At its height in the 1920s, there were about 300 Finnish language schools and 10 Finnish language newspapers in Ingria. The First All-Union Census of the Soviet Union in 1926 recorded 114,831 Leningrad Finns, as Ingrian Finns were called. The 1926 census also showed that the Russian population of central Ingria outnumbered the Finnic peoples living there, but Ingrian Finns formed the majority in the districts along the Finnish border. In the early 1930s the Izhorian language was taught in the schools of the Soikinsky Peninsula and the area around the mouth of the Luga River. In 1928 collectivization of agriculture started in Ingria. To facilitate it, in 1929–1931, 18,000 people (4320 families), kulaks (independent peasants) from North Ingria, were deported to East Karelia, the Kola Peninsula as well as Kazakhstan and Central Asia. The situation for the Ingrian Finns deteriorated further when in the fall of 1934 the Forbidden Border Zone along the western border of the Soviet Union was established, where entrance was forbidden without special permission issued by the NKVD. It was officially only 7.5 km deep initially, but along the Estonian border it extended to as much as 90 km. The zone was to be free of Finnic and some other peoples, who were considered politically unreliable. On 25 March 1935, Genrikh Yagoda authorized a large-scale deportation targeting Estonian, Latvian and Finnish kulaks and lishentsy residing in the border regions near Leningrad. About 7,000 people (2,000 families) were deported from Ingria to Kazakhstan, Central Asia and the Ural region. In May and June 1936 the entire Finnish population of the parishes of Valkeasaari, Lempaala, Vuole and Miikkulainen near the Finnish border, 20,000 people, were resettled to the areas around Cherepovets and Siberia in the next wave of deportations. In Ingria they were replaced with people from other parts of the Soviet Union, mostly Russians but also Ukrainians and Tatars. In 1937 Lutheran churches and Finnish and Izhorian schools in Ingria were closed down and publications and radio broadcasting in Finnish and Izhorian were suspended. Both Ingrian Finnish and Izhorian populations all but disappeared from Ingria during the Soviet period. 63,000 fled to Finland during World War II, and were required back by Stalin after the war. Most became victims of Soviet population transfers and many were executed as "enemies of the people". The remainder, including some post-Stalin returnees (it was not until 1956 that some of the deported were allowed to return to their villages), were outnumbered by Russian immigration. The 1959 census recorded 1,062 Izhorians; in 1979 that number had fallen to 748, only 315 of them around the mouth of the Luga River and on the Soikinsky Peninsula. According to the Soviet census of 1989, there were 829 Izhorians, 449 of them in Russia (including other parts of the country) and 228 in Estonia. After the dissolution of the Soviet Union in 1991, surviving Ingrian Finns and their Russified descendants have been allowed to emigrate to Finland. This has led to the birth of a sizable Russophone minority in Finland. ^ Based on Räikkönen, Erkki. Heimokirja. Helsinki: Otava, 1924. ^ a b c d e f g h i j Kurs, Ott (1994). Ingria: The broken landbridge between Estonia and Finland. GeoJournal 33.1, 107–113. ^ A. Pereswetoff-Morath, "'Otiosorum hominum receptacula': Orthodox Religious Houses in Ingria, 1615–52", Scando-Slavica, vol. 49, 2003. ^ a b c d e f Matley, Ian M. (1979). "The Dispersal of the Ingrian Finns". Slavic Review. 38 (1): 1–16. doi:10.2307/2497223. ISSN 0037-6779. JSTOR 2497223. ^ Inkeri. Historia, kansa, kulttuuri. Edited by Pekka Nevalainen and Hannes Sihvo. Helsinki 1991. ^ Johannes Angere, Min hemtrakt (2001) Swedish magazine Ingria (2), pages 12–13. ^ a b Martin, Terry (1998). "The Origins of Soviet Ethnic Cleansing". The Journal of Modern History. 70 (4): 813–61. doi:10.1086/235168. ISSN 1537-5358. JSTOR 10.1086/235168. The Izhorians, along with the Votes, are a Finnic ethnic group indigenous people native to Ingria. Small numbers can still be found in the western part of Ingria, between the Narva and Neva rivers in northwestern Russia. Votes, sometimes also Vods are a Finnic ethnic group native to Votia in Ingria, the part of modern-day northwestern Russia that is roughly southwest of Saint Petersburg and east of the Estonian border-town of Narva. The Finnic Votic language spoken by Votes is close to extinction. Nonetheless, the Votic language is still spoken in three villages of historical Votia and by an unknown number of fluent Votic speakers in the countryside. The villages are Jõgõperä (Krakolye), Liivcülä (Peski), and Luuditsa (Luzhitsy). Nyenschantz was a Swedish fortress at the confluence of the Neva River and Okhta River, the site of present-day Saint Petersburg, Russia. Nyenschantz was built in 1611 to establish Swedish rule in Ingria, which had been annexed from the Tsardom of Russia during the Time of Troubles. The town of Nyen, which formed around Nyenschantz, became a wealthy trading center and a capital of Swedish Ingria during the 17th century. In 1702, Nyenschantz and Nyen were conquered by Russia during the Great Northern War, and the new Russian capital of Saint Petersburg was established by Peter the Great in their place the following year. The Narva or Narova is a river flowing into the Baltic Sea, the largest river in Estonia by discharge. Draining Lake Peipsi, the river forms the border of Estonia and Russia and flows through the towns of Narva/Ivangorod and Narva-Jõesuu into Narva Bay. Though the river is only 77 kilometres (48 mi) long, in terms of volume discharged it is the second largest river flowing into the Gulf of Finland. The river gives its name to the Narva culture and the city of Narva. Kingisepp, formerly Yamburg (Я́мбург), Yam (Ям), and Yama (Я́ма), is an ancient town and the administrative center of Kingiseppsky District of Leningrad Oblast, Russia, located along the Luga River 138 kilometers (86 mi) southwest of St. Petersburg, 20 kilometers (12 mi) east of Narva, and 40 kilometers (25 mi) south of the Gulf of Finland. Population: 48,488 (2010 Census); 50,295 (2002 Census); 49,954 (1989 Census). The Treaty of Teusina, Tyavzin or Tyavzino, also known as the Eternal Peace with Sweden in Russia, was concluded by Russian diplomats under boyar Afanasiy Pushkin and ambassadors of the Swedish king at the village of Tyavzino in Ingria on May 18, 1595 to end the Russo-Swedish War (1590–95) between the powers. Toksovo is an urban locality in Vsevolozhsky District of Leningrad Oblast, Russia, located 20 kilometers (12 mi) to the north of St. Petersburg on the Karelian Isthmus. It is served by two neighboring stations of the Saint Petersburg-Khiytola railroad: Toksovo and Kavgolovo (1929). Population: 6,127 (2010 Census); 5,893 (2002 Census); 5,699 (1989 Census). Kingiseppsky District is an administrative and municipal district (raion), one of the seventeen in Leningrad Oblast, Russia. It is located in the southwest of the oblast and borders with Ida-Viru County of Estonia in the west, Lomonosovsky District in the northeast, Volosovsky District in the east, and with Slantsevsky District in the south. In the north and northwest it is washed by the waters of the Gulf of Finland. The area of the district is 2,908 square kilometers (1,123 sq mi). Its administrative center is the town of Kingisepp. Population : 19,830 (2010 Census); 20,408 ; 34,081 (1989 Census). The Estonia–Russia border is the international border between Republic of Estonia and the Russian Federation .The border is 294 kilometres (183 mi) long. In its present form, it has not changed since 1945, when Estonia became part of the Soviet Union. A small change was to take place in 2014, but this has yet to take effect. The Republic of North Ingria was a short-lived state of Ingrian Finns in 1919–1920, which seceded from Soviet Russia after the October Revolution. Its postal system was operated by the local government in co-operation with the Ministry of Transport and Public Works of Finland and the Finnish postal service.